"Nixon Considered Nuclear Option Against N. Korea"
"Richard Nixon planned nuclear strike on North Korea"
"Papers reveal Nixon plan for North Korea nuclear strike"
Seeing human rights in the "proper manner"
Newly-elected President Richard Nixon and his key advisors, National Security Advisor Henry Kissinger, Secretary of Defense Melvin Laird and JCS Chairman Earle Wheeler, considered a menu of possible military actions against North Korea, from carefully targeted attacks on North Korean military facilities, to a plan codenamed FREEDOM DROP for limited nuclear strikes (with surprisingly limited casualty expectations), to all-out war using nuclear weapons. The Pentagon drew up these plans as the result of North Korea’s downing of a U.S. reconnaissance plane over the Sea of Japan in April 1969 -- just one in a long set of military provocations by Pyongyang that continues to the present. Yet, in another pattern that would be repeated in the years since then, Nixon and his advisors were forced to heed the Pentagon’s warnings that anything short of massive attacks on North Korea’s military power would risk igniting a wider conflagration on the peninsula, leaving diplomacy, with all its frustrations, as the remaining option, coupled with the deterrent posed by U.S. conventional and nuclear forces. These vexing issues confront the Obama administration today as it seeks to forge an effective response to North Korea’s sinking of a South Korean warship last March. The National Security Archive obtained the documents posted today through multiple Freedom of Information (FOIA) requests to the U.S. government. They are part of a major new collection consisting of almost 1,700 documents, The United States and the Two Koreas, 1969-2000, which the Archive is publishing through ProQuest, on the eve of the 60th anniversary of the start of the Korea War on June 25th, 1950. The early recognition that military strikes against North Korea, regardless of the provocation, carried serious risks of inciting retaliation by Pyongyang and the threat of escalation. The growth in the list of available options from limited strikes on selected North Korean airfields to, by the fall of 1969, at least two dozen plans, which targeted the full spectrum of North Korea’s military forces, and covered a wide range of scenarios to provide flexibility to the president in confronting future North Korean provocations. The emphasis on the need to neutralize North Korea’s air power, in any response to a provocation greater than the downing of the U.S. reconnaissance plane, in order to minimize the risks of retaliation and escalation. To this end the JCS drew up a plan codenamed FRESH STORM to take out Pyongyang’s military air power, but warned that carrying it out would carry some risk of sparking a major war on the Korean peninsula. The development of a nuclear contingency plan, codenamed FREEDOM DROP that called for “pre-coordinated options for the selective use of tactical nuclear weapons against North Korea…” The available options included limited attacks on North Korean command centers, airfields, and naval bases with atomic weapons ranging from .2 to 10 kilotons, delivered by air or Honest John/Sergeant missiles, as well as at the upper end an attack with 10 to 70 kiloton weapons geared to take out North Korea’s air power and diminish the country’s overall military capability. Depending on the size of the attack, the estimated “friendly losses” would be “Less than 10 percent,” and civilian deaths would range from “approximately 100 to several thousand." As these documents show, Kissinger repeatedly pressed the Pentagon to develop a range of effective and calibrated military strike options that the President could draw upon in the event of future such North Korean actions. Despite the impressive array of alternatives, Nixon and Kissinger came to realize that none of these limited options could provide acceptable assurance against North Korean counter-attacks and escalation of the conflict. The only viable political choices were non-military responses combined with diplomacy, or a military strike, possibly involving nuclear weapons, that would eliminate North Korea’s ability to launch air strikes -- in effect declaring war on Pyongyang. The National Security Archive is releasing this month a major new collection, The United States and the Two Koreas, 1969-2000, as part of the Digital National Security Archive, published by ProQuest. The declassified documents in this set, most published for the first time, provide a unique window into U.S. foreign and defense policies regarding the Korean Peninsula. In particular, the set includes a number of documents that shed light on the efforts to devise military plans to respond to North Korean provocations. The list of provocative North Korean actions confronting U.S. presidents from Nixon to Clinton includes the seizure of the Pueblo in 1968, the downing by North Korea of a U.S. reconnaissance plane over the Sea of Japan in 1969, the ax murders of U.S. soldiers by North Korean military personnel in the infamous 1976 DMZ tree-cutting incident, and the tensions over Pyongyang’s nuclear weapons program. Yet, while suspicions of an Iraqi nuclear program, later shown to be unfounded, led to the U.S. invasion and overthrow of Saddam Hussein, North Korea’s admitted violation of the 1994 Framework Agreement to end their nuclear weapons program, the subsequent testing of nuclear weapons and the recent sinking of a South Korea naval vessel with loss of life has not resulted in any military action. The preferred focus has been on diplomacy with Pyongyang, despite all its frustrations. As Sherlock Holmes might ask, why has this dog not barked? The answer is likely rooted in the profound uncertainties and risks surrounding any military options against North Korea. For example, this is why the Clinton administration reportedly considered, only to reject, “surgical” strikes against Pyongyang’s nuclear installations as well as broader action that could risk renewed all-out war. (Note 2) While current military plans are cloaked in secrecy, and rightly so, it is now possible to obtain a better understanding of these political and military uncertainties through the fascinating set of documents found below, all of which come from The United States and the Two Koreas:1969-2000. These documents trace the elaboration of a growing list of military contingency plans against North Korea developed four decades ago in the wake of North Korea’s downing of the EC-121 reconnaissance plane in April 1969. Henry Kissinger discussed the politics and diplomacy surrounding the U.S. response to this incident at length in his memoirs, where he is bitingly critical of President Nixon’s decision not to respond forcefully to the provocation and of the crisis management procedures that hindered any quick decision on a U.S. response, a response Kissinger later characterized as “weak, indecisive and disorganized.” (Note 3) (On this latter point, Warren Nutter’s critique of the crisis planning mechanism is very revealing; see Document 6) As Kissinger’s memoir recounts and subsequent secondary accounts confirm, Nixon considered but ultimately rejected more forceful military action to secure recompense against Pyongyang, settling for the resumption of reconnaissance flights with armed escorts and moving two aircraft carriers into the Sea of Japan as a show of force. A significant body of declassified diplomatic records is now available to augment Kissinger’s account. (Note 4) Just last month, the State Department Historical Office released the Foreign Relations of the United States volume on U.S.-Korean relations during the first Nixon Administration. (Note 5) This volume provides critical new documentation on the debates within the recently-inaugurated Nixon administration over how to respond to the downing of the U.S. reconnaissance plane, offering more evidence of the growing reluctance to engage in any major military action that carried the risk of escalation. Of particular importance are the telcons of discussions between Nixon and Kissinger about the crisis, and documents discussing the work of the Washington Special Actions Group (WSAG) and a Korean Task Force in developing the policy options. However, while these documents and others give glimpses of the military contingency plans under review (see for example FRUS documents nos. 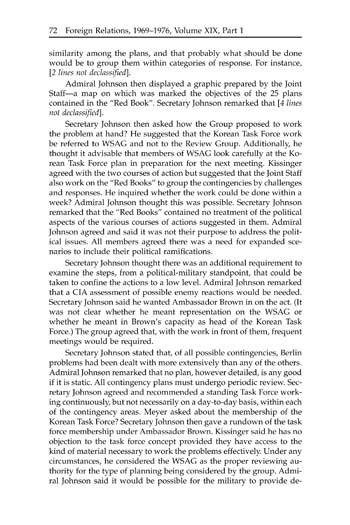 7, 13 and 26, with the latter providing the most information about contingency plans), the FRUS volume does not provide much by way of detailed information about these plans that would allow scholars to place the policy debates in context; see for example the heavily redacted Memorandum from Kissinger to Nixon passing on the Pentagon’s contingency plans, dated May 5, 1969, that is document no. 22 in the FRUS volume. The page on the left is from the FRUS Volume, Page 72, indicating the deletions in the first two paragraphs. The page on the right, taken from Document No. 12, included the redacted material, found in the second and third paragraphs. Click on the images for a larger version. The documents published here provide much of this essential context, as well as reveal the wide spectrum of military plans developed, up to and including nuclear strikes. It is especially difficult to grasp the rationale for the continued classification of the military plans in the FRUS volume, both nuclear and conventional. The passage of over 40 years and the significant changes that have occurred since that time in the U.S nuclear posture, including the withdrawal of all U.S. theater and tactical nuclear weapons from the field under President George H. W. Bush, strongly suggests that these plans, while of great historical importance, have no relevance to current contingency plans for the peninsula. As the documents below reveal, when the EC-121 was shot down there were no fully elaborated retaliatory options providing detailed information as to forces required, operational timelines and likely impacts. The early options were for strikes targeting one or more North Korean airfields, with an eye to demonstrating U.S. resolve and limiting the risk of escalation. As the ongoing development of military options unfolded, a number of recurring strategic constraints emerged, including concern about the impact of any military action on U.S. operations in Vietnam, the risk of North Korean retaliation and subsequent escalation to a wider conflict, and imponderables such as the likely Chinese or Russian response to U.S. military action against a putative Communist ally. What emerged by the summer of 1969 is a long list of nearly 25 military options, ranging from evacuation of U.S. personnel in a crisis to limited nuclear strikes using kiloton-range nuclear weapons that involved possible casualties in the thousands, and all-out war in response to renewed North Korean aggression against South Korea. The military situation facing the United States and South Korea today carries its own set of imponderables and risks. As seen in the documents below, the primary concern of military planners in 1969 was North Korea’s air force and the difficulties involved in deterring any North Korean retaliation to U.S. actions that could escalate hostilities into a more wide-spread conflict. Today, while Pyongyang’s air force is viewed as obsolete, North Korea’s military forces are still seen as posing a serious threat. As noted by the State Department, North Korean forces have a substantial numerical advantage over the South (around 2 to 1) in several key categories of offensive weapons, including tanks and long-range artillery. The main threat is posed by the concentration of North Korean forces along the Demilitarized Zone, including rockets that can strike Seoul and large portions of South Korea with little warning. (Note 6) So, while the specifics of the North Korean military threat have changed, the central dilemma posed by the need to avoid uncontrolled escalation and extensive military strikes against South Korea still exists, it would seem. If the strategic and political calculus regarding military options against North Korea arrives at similar conclusions today, then it may be understandable why diplomacy remains the preferred option, even with all the uncertainties surrounding that course. Laird passes on to Kissinger a memorandum laying out the first rough draft of the Joint Chief’s concept of possible targets for air strikes in North Korea that the US might hit in retaliation. This initial plan examines air strikes launched from land, carriers, or a combination of the two. The targets are North Korean military installations: Wonsan AF and Sondok AF near Son Dong Ni. Targets on North Korea’s west coast were not considered because of the concentration of North Korean SAM missile sites, the higher risk of confrontation with Communist China if the U.S. launched attacks from the Yellow Sea, and the desire to avoid over-flights of South Korea. The goal would be to disrupt Pyongyang’s military posture and impose a penalty on the North Korean leadership for shooting down the U.S. aircraft. The U.S. forces available for carrier-based attacks were the USS Enterprise, Kitty Hawk, Ranger and Hornet, with reaction times ranging from 48 to 72 hours. For land-based retaliatory attacks, the US could draw on tactical fighter aircraft (F-105, F-4) based at Kadena AB in Okinawa; Yokota, Misawa in Japan, Taegu and Osan in South Korea and B-52’s on Guam. Proposed protective measures in the event of a North Korean retaliatory attack against South Korea included declaring covert DEFCON 3 status at the launch of the strike force and overt DEFCON 1 at the time of attack, and maintaining Single Integrated Operation Plan (SIOP) alert throughout WESTPAC. The Joint Chiefs assessed possible North Korean responses to a U.S. retaliatory strike as ranging from retaliatory attacks against the sea and land bases of the U.S. strikes to reopening hostilities along the DMZ. No direct Communist Chinese interference was expected, though political attacks were likely. The JCS expected Soviet forces to keep a close watch on US operations, while Moscow would launch propaganda attacks and likely increase material aid to North Korea. This document outlines the main points to be covered at an emergency NSC meeting to discuss possible U.S. responses combining diplomacy and military action to the downing of the EC 121. [See document no. 13 in the FRUS volume for Alexander M. Haig’s notes on this NSC meeting.] Again, a spectrum of possibly responses is outlined, ranging from a show of force to single strikes or broader military action, each aligned with specific diplomatic objectives. For example, in the event of single strikes or broader action, U.S. diplomacy should establish the legal basis for the U.S. action, neutralize international criticism while developing a “modicum” of support for the U.S., and to seek public support for military action in Korea and continued US commitments in Asia, particularly Vietnam. Diplomatic options without military action were also under consideration, so-called high and low postures, with the first aiming to secure maximum publicity and to mobilize public opinion, and the latter centered on working behind the scenes to achieve some accommodation with NK. Even with the high and low postures, the US would seek to make clear privately the U.S. determination to react militarily to any future provocation. As the cover sheet indicates, this “urgent” paper was the subject of discussion at the NSC meeting on April 16th, noted in the above document. It provides a fuller exposition of the diplomatic/military options under consideration, and their respective pros and cons. Each course of action is evaluated in terms of achieving one or more of a list of over-arching goals, which are similar to those outlined in the previous document, encompassing maintenance of U.S. legal rights, deterrence of similar acts in the future, exacting redress through retaliation or compensation, fostering international condemnation of Pyongyang’s actions and avoiding criticism of any US action, and maintaining U.S. domestic support. This paper also provides a more extended discussion of the purely diplomatic high and low posture options, involving talks at Panmunjom, approaching the Soviets, closed meetings on the model of the discussions about the seizure of the Pueblo, and UN options. In this draft memorandum, the JCS lay out their argument in favor of B-52 strikes against the Wonson AND Sondock North Korean airbases, as opposed to fighter aircraft. Among the advantages seen are the greater bomb delivery capability (up to 108 bombs per B-52 versus 12 to 18 delivered by each tactical aircraft); the better odds for surprise using a smaller number of aircraft and launching it from a more remote area, such as Guam; the attack could be mounted more quickly; and the B-52s can carry out night, all-weather, low-level attacks, increasing survivability. Possible disadvantages included less maneuverability and so possibly more vulnerability to anti-aircraft fire; the loss of face if the U.S. did lose a B-52 in an attack; and possible adverse Soviet reaction to a B-52 attack so relatively close to the USSR. Under this scenario, the U.S. would launch anywhere from 12 to 24 B-52s from Guam for a night-time, low-level attack. Air refueling would be provided by KC-135’s based at Kadena. The force could be launched 24 to 48 hours after the decision to go ahead, and the bombers would reach their target about six hours after launch. In this memorandum, Assistant Secretary of Defense Warren Nutter gives Kissinger his views on the problems revealed by the response of the U.S. planning process to the EC 121 crisis, a critique that Kissinger later echoed in his memoirs. Nutter sees the process developing in two stages: preliminary analysis of alternative courses of action, and preparation of detailed contingency plans for courses under serious consideration. Important points emerging from Nutter’s analysis include the fact that “virtually no progress was made on preliminary analysis of alternative military responses” over the 12 hours period from 0800 to 2000 on April 15th. Despite lengthy discussion and drafting, the options initially outlined by the JCS that morning (see documents above) remained largely unchanged, with little progress made in evaluating the basic options open to the U.S. It was left to a NSC Review Group to work into the small hours of the morning on April 16th to develop an options paper suitable for discussion by the NSC later that morning. As the result of this NSC meeting, a special EC 121 Group was created to develop prepared contingency plans for two possible course of action, one of which was discarded. On April 18th, the Group spent nearly 8 hours developing a detailed scenario and contingency plan for the remaining option (i.e., likely the seizure of a North Korea merchant vessel). While this planning exercise was valuable, it became moot, as by the next day President Nixon had decided not to pursue the remaining option under consideration. As Kissinger noted in his memoirs, once the initial crisis had passed, Nixon turned his attention to the need for a fuller elaboration and analysis of military options in the event of a future North Korean crisis. This NSSM initiates at Nixon’s direction the development of a “full range of military contingency plans” to deal with future North Korean provocations. What now constituted a full range went from low-level NK insurgency actions to higher levels, including actions such as the EC-121 incident. The Joint Chiefs prepared these new plans in response to a request that Kissinger made to Laird during a talk on April 30th. This new set of options includes strikes on one North Korea airfield at Wonsam using B-52s, carrier-based or land-based U.S. tactical aircraft; strikes on 4 North Korean airfields - Wonsam, Sondok, Pyongyang East and Saamchan - using one of the same three options; and a plan for a strike, likely of a follow-on nature to any initial attack, on four North Korean “remunerative military targets,” which included the Munchon naval base, the Mayang Do submarine base, and the Songjon Pando missile support facility. The JCS did not develop plans for strikes against 2-3 airfields, arguing that any strike beyond one target must include attacks on at least 4 targets in order to inflict the “maximum feasible attrition” against North Korea’s air power, and thus ability to retaliate. All of these options carried major risks, as the Joint Chiefs warned that “Any attack on North Korea, including those described in [these] contingency plans, entails a substantial risk of a major attack on the ROK by North Korea.” To meet this threat, the Joint Chiefs indicate they have prepared a contingency plan that would involve “an attack of sufficient size to neutralize the entire North Korean air order of battle,” using B-52, land- and carrier-based aircraft. They conclude that there was a reasonable chance that a night attack against one airbase, carried out quickly and with surprise so as to present a fait accompli, might not provoke the North Koreans into a major retaliation. Still, they felt it was preferable to carry out any attack from all land and sea-based forces of sufficient size to neutralize North Korea’s ability to launch a retaliatory air attack on South Korea. Finally, the Joint Chiefs warned again that it would be impossible to predict how Russia or China would react. This memorandum describes a plan provided from the Commander in Chief, Pacific (CINCPAC) for using TALOS missile ships against North Korean military aircraft as one additional “measured” option for U.S. retaliation against future North Korean provocations. The objective would be destruction of North Korean military aircraft operating from or between Wonsan and/or Sondok airfields in retaliation for future illegal actions by Pyongyang. The past success of the TALOS against North Vietnamese aircraft is cited as grounds for believing the missiles would be equally successful against North Korean aircraft. The proposed plan, codenamed FRACTURE PINE, would station two TALOS ships off the North Korean east coast to shoot down any North Korean military aircraft operating out of or between the two bases mentioned earlier. The memorandum further outlines the proposed rules of engagement under which the TALOS ships could fire on the North Korean aircraft, which included firing on aircraft showing hostile intent towards the TALOS task force as well as on aircraft positively identified as North Korean, regardless of perceived intent. With this memorandum, Laird passes on the contingency plan described in document 10, with the recommendation that both he (Laird) and CJCS Wheeler find this plan “more sensible than any yet postulated.” Attached to this memorandum are two handwritten notes from Laird’s military assistant, Robert Pursley. One, dated May 22nd, offers Pursley’s agreement that the plan is more sensible than any yet considered. The second note, dated May 8th, states that “While we may not want to consider too seriously any of the North Korean contingency options, I believe there is merit in having the JCS consider a more complete – and more reasonable – range of options.” Finally, there is an attached table titled “Summary of JCS Options” which provides an overview of options developed to date, included types of aircraft, general target types, tons of ordinance delivered and expected losses. In this memorandum, Laird gives voice to his concerns about U.S. contingency planning, in the context of a new White House request for yet another contingency plan that would provide a measure of deterrence against North Korean retaliation for a U.S. retaliatory strike. Laird finds two assumptions implicit in this White House request troubling. First is the assumption that US strikes against a limited number of North Korean airfields would deter any North Korean strike against South Korea. The second assumption is that a one-time strike targeting a North Korea power plant complex (identified as Changjin in documents below) and some reasonable though limited number of North Korea airfields would serve as an appropriate U.S. retaliation and, again, deter Pyongyang from retaliating in kind. Laird is not sure either set of strikes would have this deterrent effect. Laird believed that either larger initial U.S. strikes or sustained U.S. military efforts would be required to deter North Korea, and asks for Wheeler’s judgment on these issues. This key document, prepared at Kissinger’s request for discussion at an upcoming meeting of the Washington Special Actions Group, outlines the full spectrum of contingency plans developed for consideration since the EC-121 incident, and which now includes an outline plan for nuclear operations against North Korea. As the preface indicates, these plans were developed by the CINCPAC, the Strategic Air Command (SAC) and the JCS to “support the attainment of United States politico-military objectives in a potential crisis situation involving the Republic of Korea.” The preface also stresses that the options, numbering over 25 (including sub-options within the main ones) cover a wide range of possible responses and so provide great flexibility and the ability to implement them in multiple variations to tailor the military response to the particular situation. In addition to the plans outlined in this document, more than a dozen others were reported under consideration by CINCPAC and the JCS. The 13 main options in this document range from non-combatant and emergency evacuation in the event of a crisis to the airstrikes on North Korean airfields and power plants discussed in earlier documents, to a nuclear contingency plan for North Korea containing three options, and the defense of Korea. The nuclear contingency plan, codenamed FREEDOM DROP and found at Tab L, seeks to provide “pre-coordinated options for the selective use of tactical nuclear weapons against North Korea” short of the plan for defense of South Korea against a renewed attack by North Korea. The first option involves a punitive attack against up to 12 military targets with nuclear weapons of a yield of .2 to 10 kilotons delivered by USAF tactical fighter aircraft based in South Korea, by carrier-based attack aircraft or by US Army Honest John/Sergeant missiles, or a combination of all three. Targets included command controls centers, three airfields, two naval bases and a missile support facility. Option 2 involved an attack with 70 kiloton nuclear weapons to neutralize North Korea’s military air power in response to a North Korean air attack on South Korea. The same three means of delivery were indicated, with all 16 major North Korean airfields targeted. The final option calls for an attack with nuclear weapons ranging from 10 to 70 kilotons aimed at diminishing greatly North Korea’s offensive capability. Using the same means of delivery, the targets would include all those in options 1 and 2 plus 22 additional military targets. Losses of U.S., South Korean and other allied forces were estimated at less than 10%, while civilian casualties, depending on the size of the attack, could range from around 100 to several thousand. Nuclear options were also part of the plan for defense of South Korea against renewed North Korean aggression, discussed at Tab M, particularly if needed to offset Communist numerical superiority in forces. 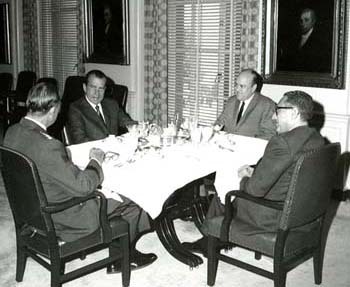 At this meeting, Kissinger was joined by U. Alexis Johnson from the State Department, G. Warren Nutter from the Pentagon, Cord Meyer from the CIA and Vice Admiral Nels C. Johnson, Director of the Joint Staff, along with Colonels Alexander Haig and Robert Behr of the NSC staff, to discuss the contingency plans drawn up for military action against North Korea, which were summarized in document 13. The discussion is important for understanding the political drivers of the contingency planning as well as the uncertainties that surrounded the process. Kissinger stressed that President Nixon’s goal with these plans was not “esoteric speculation” about events that might lead to a crisis, but to have options that would be useful in specific situations, and for each of these options a check list of what he has to do linked with possible reactions and outcomes. Kissinger also discussed the “lessons learned” that he took from the administration’s response to the EC-121 incident. Characterizing his own initial reactions as “probably naïve,” Kissinger said that the “main lesson he learned from the incident was that the trick in any action taken would be to preclude a counter blow. “ He indicated Nixon had similar second thoughts, musing that if a situation similar to the EC-121 incident occurred in the future and a B-52 strike was deemed necessary, the price to be paid was not much greater for a strike involving 25 aircraft than with three. “The need is to look determined and, if the object is to prevent counter-measures, the action taken should be a powerful blow.” Concluding, Kissinger believed that if a similar situation arose again, Nixon would probably either do nothing or select an option toward the “extreme end of the range of possibilities.” As Vice Admiral Johnson noted, this was a conclusion shared by the JCS. 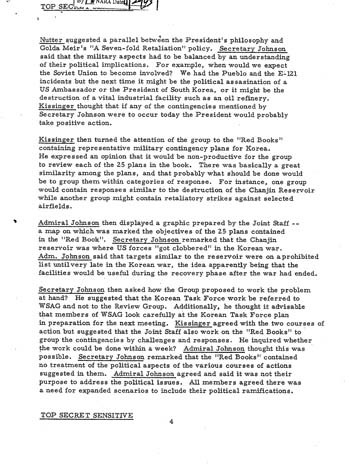 This memorandum and its attached draft memorandum, provides the Joint Staff’s response to Laird’s memorandum of June 24th and Kissinger’s request on June 23rd for development of a plan for striking the Changjin Power Plant and a concurrent disarming strike against 5-6 military airfields in North Korea. In passing on this plan, Wheeler warns that “It is clear . . . that execution of this plan would be considered highly provocative by the North Korean government.” Moreover, as the proposed plan would not reduce North Korean military air power to a level precluding their retaliation, the Joint Staff felt the plan would entail significant risk and so was not an appropriate response to future North Korean provocations. Having laid out this risk, Wheeler and the Joint staff provide their views on what would constitute appropriate and effective military options. For incidents on the level of the EC-121 incident, they recommend an air attack on a single military target, or other military response of similar size and scope, carried out quickly and with maximum surprise, would be the desired response and carry a lower risk of North Korean retaliation on South Korea. To this end, the Joint Staff had prepared and forwarded several plans of this type. If the North Korean provocation is of greater magnitude, then the U.S. must seek to neutralize North Korea’s military air power through successive, multiple strikes against all major North Korean military airfields with sufficient forces, Wheeler and the JCS argued. CINCPAC had prepared an operational plan named FRESH STORM for military strikes to neutralize North Korea’s air order of battle. The JCS acknowledged that execution of this plan would carry some risk of initiating a major conflict on the Korean peninsula, but felt that a similar risk adhered to the more limited contingency plans, which did not have the advantage of eliminating the North Korean air threat. With this memorandum, Laird forwards the Wheeler memorandum of July 9th (see above) providing a new contingency plan for a combined attack on the Changjin Power Plant and a number of North Korean airfields, along with the earlier memorandums regarding this request. Laird’s sole observation in forwarding this new plan is to stress Wheeler’s warning that “a number of difficult issues are posed in contemplating any military action of the type requested in the attached contingency plan,” a warning that Laird believes the U.S. government needs to consider seriously. This final document provides an overview of the military options developed or in development as of September 1969, and reflects much of the planning discussed in the previous documents. Five months after the EC-121 incident brought to light the serious gaps in U.S. contingency planning for dealing with Korean military crises, the U.S. government now had 14 plans, some with sub-options, completed and the “appropriate authorities” briefing on, and 8 new options under consideration or previously considered. Based on the information available in the earlier documents, particularly document number 14, the deleted material in the list of completed plans is likely Plan FREEDOM DROP for tactical nuclear operations against North Korea. 1. On these topics, see South Korea Publicly Blames the North for Ship’s Sinking, by Choe Sang-Hun, The New York Times, May 19, 2010; and N. Korea Reshuffle Seen as Part of Succession Plan, by Choe Sang-Hun, The New York Times, June 7, 2010. 2. On military planning in the Clinton administration during the 1993-1994 nuclear crisis with North Korea, see Joel S. Wit, Daniel P. Poneman and Robert L. Gallucci, Going Critical: The First North Korean Nuclear Crisis (Brookings Institution Press, 2004, pp. 176-182, 205-206, 210-211, 226-227. 3. See Kissinger, White House Years (Little Brown, 1979), pp. 312-321 on the EC-121 shootdown and the Nixon administration’s response; the quotation is from page. 321. Kissinger did see the crisis as having a positive effect on the administration’s ability to respond to future crisis, in part through leading to creation of the Washington Special Action Group to coordinate crisis management. 4. See especially the Wilson Center’s North Korea International Documentation Project’s critical oral history conference in September 2008 entitled Crisis and Confrontation on the Korean Peninsula: 1968-1969 and related document briefing book. The document briefing book contains an invaluable collection of U.S. and South Korean declassified diplomatic records on the Pueblo, EC-121 and Blue House Raid crises. 5. Foreign Relations of the United States, 1969–1976, Volume XIX, Part 1, Korea, 1969–1972, available online. 6. See in this connection the State Department’s overview of North Korea’s military capabilities. Further details on the North Korean missile and rocket threat can be found on the Nuclear Threat Initiative website.